Happn is a free dating app that uses your location services on your phone (always on in the background) to show you profiles of people that you have “crossed paths with”. It tells you when you crossed paths, how many times you’ve crossed paths, and gives you a little map of the location that you crossed paths at. While all of this can seem very creepy, dating in a big city that takes FOREVER to get across makes dating someone on the other side of town tricky. I don’t know if you non-angelenos have heard about this little rumor, but there is indeed a ton of traffic in LA. This app is nice because it shows you people who are near the places that you frequent the most- for me it’s home and work. Initially when you think about this concept you may picture walking by someone cute on the sidewalk, both of you do the look back to check each other out, but oh no, you’re late! No time to stop and talk! That’s not really how this app works. In real life, people are driving or walking by my apartment (or going to In & Out which I live right next to) while I’m inside on my couch watching Real Housewives and we never see each other except for on our phones. So if you’re creeped out about the location tracking part of it, rest assured that no one is going to walk up to you and say “Hey! 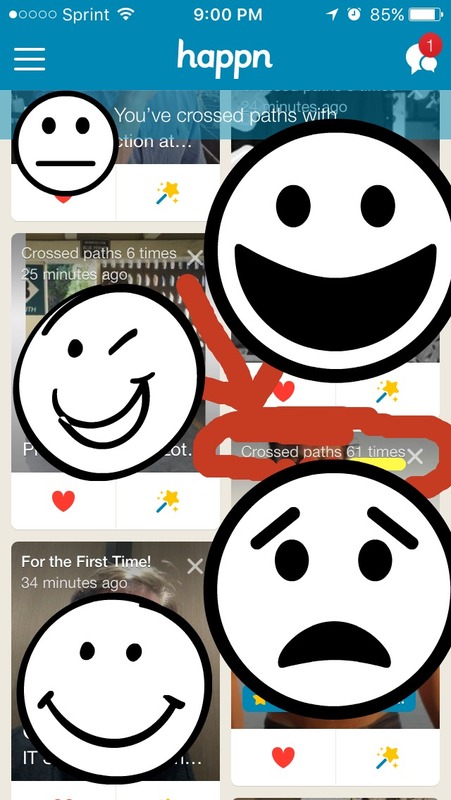 I saw you on my phone!” The app considers that you have encountered someone if your paths cross between 1m and 250m. The app won’t tell you the exact distance for privacy reasons. I’ve been on happn for less than 2 weeks and have somehow crossed paths with this person 61 times!?!? How can you connect with people on happn? Happn is different than Tinder and Hinge in that it doesn’t give you one profile at a time to swipe right or left on, it gives you a page you can scroll through with everyone you have passed by instead. You can then “like” them secretly by pressing the Heart button. They won’t find out you like them unless they have “liked” you too and then you will be alerted about your “new crush”. One they’re on your crush list you can message each other. If you have already “liked” someone and haven’t heard back and are desperate to get their attention, you can “charm” them and send them a notification that you’re interested. The charms are limited, though, you only get 10 when you join and then you must buy more. I’m not sure if you get more after being on the app for a while or not because I haven’t been desperate enough to send a charm. You are also able to manage a few filters in your preferences- you can select if you want to find men, women, or both, and the age range you want to see. I selected “men” and I’m 29 and the age range I picked was 29-42 in case you were curious. The non-swipe set up of happn has some pros and cons. Whenever I refresh my feed there are new people I’ve crossed paths with. There are a few hundred people I can scroll through who I’ve crossed paths with in less than 2 weeks. That’s a ton of people and a bit overwhelming. One thing I wish they’d change is when you “like” someone and they haven’t liked you back, they still show up on your Home page or feed. I wish they’d be sequestered to a separate list so I could choose to just look at new people. You do have the option to “X” people you don’t want to see again (even if they cross paths with you), but I wish you could “X” people who send you charms so they would get off the list. Like I said it’s a bit overwhelming to look at an endless supply of people and figure out who you should prioritize talking to. The profiles on happn provide limited information which is short and sweet, but doesn’t tell you a whole lot about a person. Hinge tells you someones education and job (it takes the info from Facebook), but on happn you have the option to type in your Job/Employer/School so there’s a lot of weird vague joke answers (Hint: just leave it blank dudes, saying you went to the ‘School of Hard Knocks’ ain’t cute). Happn also shows your first name, age, and up to 9 pictures that you can select from your Phone Camera/Library, Facebook, or Instagram. I still generally decline and side eye anyone who says “I’m 57 not 37, I don’t know why it says that!” ….because it gets the information from your Facebook profile… There’s even a link at the bottom of your profile that says “Wrong Age? Synchronize with Facebook>”! One feature that Happn has in common with other dating apps is because you must use Facebook to create a profile, it shows you any mutual Facebook friends. I love screen shotting them and texting it to our mutual friend (especially if they are one of my close friends) and asking “What’s wrong with this one?” The other day my friend replied “OH HEAVENS NO. I don’t even have all the time to explain. Can I call you?” I sent a different guy to a different friend and she replied “Oh no no no no. Lordy that one.” So yeah, always background check. All in all I find happn only mildly creepy and so far I’m enjoying it. The selection isn’t quite the ivy leaguers in tuxedos that Hinge used to be, but it’s not too bad. I’ve already seen 2 guys I’ve met from other dating sites on it that I didn’t find the need to immediately block so that’s a good sign. For some reason there’s a lot of European guys too if you’re into that. So far I’ve been on one date with someone I met on happn and he was a perfectly nice person. Please let me know in the comments what you think the best dating app out right now is! Am I missing out by not being on Bumble? Please don’t say Raya because your girl does NOT have enough Instagram followers to get accepted into Illuminati Tinder!